Movie Review: Acclaimed Canadian filmmaker, Denis Villeneuve, presents us an inscrutable exercise on suspense, obscurity, and surrealism, where von Trier meets Cronenberg. 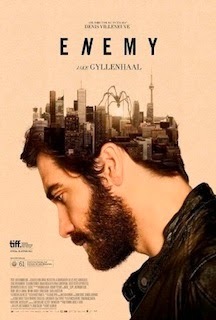 “Enemy” was based on the novel “The Double” by Portuguese Nobel Prize winning author José Saramago, and adapted for the screen by Javier Gullón who took the premise: ‘chaos is an order yet undeciphered’ to good terms. How would you react if you find that another man looks exactly like you? David Bell is an introverted history professor, whose life seems not to be fulfilled, especially in regard to his amorous relationship. One day, while watching a movie, he discovers Anthony St. Claire, a self-assured small actor who is exactly his look-alike. Ruminating about this discovery, Adam decides to meet Anthony, in a strange move that will mess with their heads in completely different ways. The two men will switch houses and women, trying to find more about each other and themselves. Visually oppressive with its pale filtered tones and aerial shots showing the geometrical arrangement of the buildings, “Enemy” is an organized delirium (chaos) that invites its viewers to decide what they want to do with this inscrutable story - a bad dream, a longstanding hallucination, a traumatic situation triggered by arachnophobia, or even a movie inside the movie. You are still confronted with the choice if Adam and Anthony are two opposite sides of the same person or two identical persons with opposite personalities. The non-answering ending might be a frustration for some but for me was almost impossible to escape from the spell of “Enemy”.